Copper-clad Aluminum Wire（CCAW・HCCAW） – Shibata Co., Ltd.
Copper-clad Aluminum Wire is a composite conductor with aluminum as the main material. 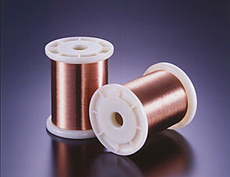 Copper-clad Aluminum Wire is a composite conductor with aluminum as the main material.As it is composed of aluminum core and copper cladding,its characteristics lie between those of aluminum and copper. ※HCCAW　High-tension Copper-Clad Aluminum Wire. – Lighter in weight than copper. – Higher in conductivity than aluminum. VCM Coils, Optical pickup coils, air core coil, Voice coils.